models - so is this a case of one being better than two? Updated at the end with the RM-V210 and RM-EZ4. o, you’re looking for a universal remote control. One that can control your entire audio/video system, is simple to set up, costs only a few dollars, and most importantly should look and feel good. Don’t want much, do you! In the budget category there’s a veritable cornucopia of preprogrammed-only remote controls to choose from, each one emblazoned with an easily recognizable brand name: GE, One For All, Philips, Radio Shack, RCA, Sony, Zenith and more. Flip over to the back of the impossible-to-open plastic blister packs and the specifications will boast about that particular model’s unique capabilities for controlling your A/V system. After staring at one store’s selection of remotes for a while, you may find that those descriptions all begin to blend together and sound exactly the same. No, this isn’t just your imagination – there really are only a few remote control manufacturers out there capable of producing functional yet inexpensive remotes, and chances are high that if two otherwise completely different remotes sound the same... they probably are. But not all of them! 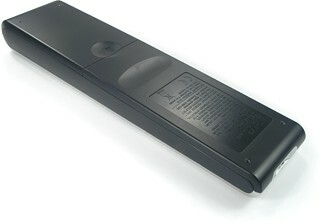 Sony’s lineup of budget-level universal remotes manages to remain unique from the rest, using their own designs, features, setup style and preprogrammed code database. But is this a situation where being different is helpful, or a hindrance? 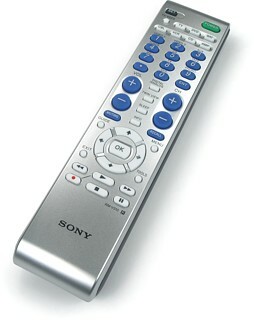 Several years ago Sony completely revitalized their low-end remote control offerings with a total of 5 models ranging from the $10 four-device RM-V202 to the $30 eight-device RM-V502 (read our review of all five remotes). Varied selection is good, but too much selection with so little price difference can be confusing – and so, recently, Sony decided to simplify their offerings with the introduction of a single new model. The $15 USD MSRP Sony RM-V310 replaces both the $15 five-device RM-V302 and $20 seven-device RM-V402. Sony continues to market the original RM-V202 and big-buttoned RM-EZ2 alongside their latest offering. Although the RM-V310’s name might lead you to believe that it’s the direct descendant of the RM-V302, being capable of controlling up to seven devices would make it more closely related to the RM-V402. The LCD-enabled RM-V502 has also been discontinued, due to the release of the lower priced (but far, far more capable) RM-VL600 learning remote control, which we cover in another review prepared at the same time as this one. Why make one remote when you can make two? In fact, it’s the recent introduction of the RM-VL600 that evidently presented Sony with the perfect opportunity to economize on design efforts and create not just one, but two models based on the same button layout and case. Thus the simultaneous release of the RM-V310, which is nearly identical to the RM-VL600 save for a few minor design changes to reflect the modified specifications. Since these two models are so similar, some of the physical description below will be familiar to those of you who have already read our RM-VL600 review.